Dh'iarr fear a bha uair na cheannard air Comhairle na Gàidhealtachd gun tèid an fhèis chiùil, Blas, a ghleidheadh. Tha Mìcheal Foxley air a bheachd a sgaoileadh dha comhairlichean air fad na Gàidhealtachd. Thèid buidseat na Comhairle a stèidheachadh Diardaoin is feum aca air sàbhalaidhean còrr 's £30m. Thathas a' moladh taic-airgid Bhlas a ghearradh. Thuirt Fèisean nan Gàidheal, a tha a' stiùireadh na fèise às leth na Comhairle, gum biodh ceistean mòra ann mu Bhlas ma thèid gearradh 81% thairis air trì bliadhna air adhart. Thuirt Dr Foxley gun robh e na phàirt de bhuidhinn bhon Chomhairle a chaidh gu Alba Nuadh ann an 2002 'son meòrachadh air mar a ghabhadh ceanglaichean a stèidheachadh eadar a' Ghàidhealtachd is Ceap Breatainn. Dh'innis e gun tug an fhèis, Celtic Colours, buaidh mhòr orra, is gun tàinig e a-steach orra gun robh feum air an leithid air a' Ghàidhealtachd. Tha Dr Foxley ag ràdh gu bheil fios aige gur e àm glè dhuilich a th' ann dhan Chomhairle is gum bi co-dhùnaidhean goirt ann. Thuirt e, ge-tà, gun cuir gearradh de 81% às dha Blas. 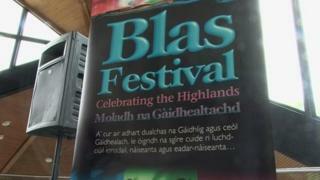 Dh'iarr gun tèid na gearraidhean sin a sgaoileadh air feadh bhuidhnean ealain is culturail gus Blas "a chumail beò". Thuirt e gu bheil Celtic Colours aig Canada is Celtic Connections aig Glaschu, ach gu bheil cunnart ann gum bi a' Ghàidhealtachd, "dachaidh ceòl traidiseanta na Gàidhlig", as aonais fèis. Thuirt Ceannard Buidseat Comhairle na Gàidhealtachd, Bill Fernie, nach robh a-riamh dùbhlan cho mòr aca buidseat a chothromachadh.